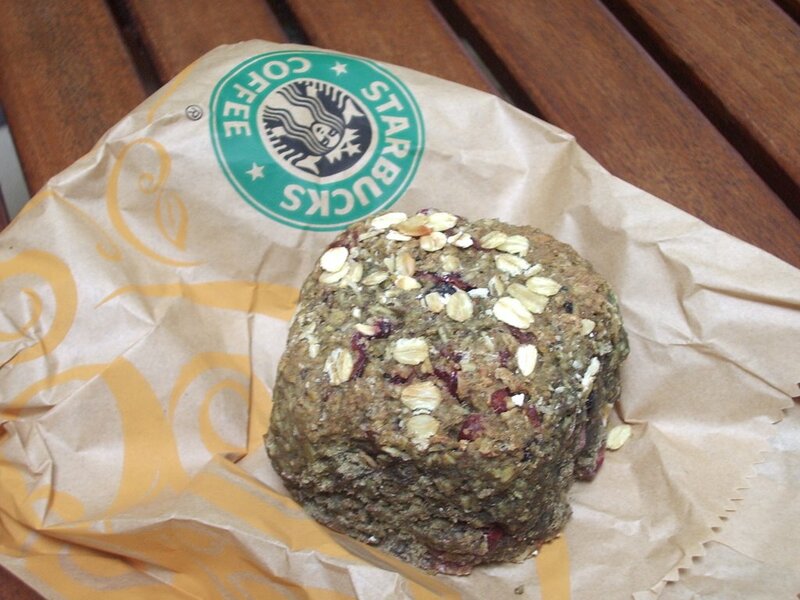 The Starbucks Oatcake. Only found in Hawaii. And not even all of Hawaii. Only on the island of Oahu. Kinda neato, eh? I was introduced to these mysteriously ugly brown rounds by my friend Noelle. She would bring them into our high school newspaper office every so often and munch on them for breakfast/lunch/snack, or whatevers. I was intrigued. It took quite a while to eat, those heavy monsters. And they weren’t very attractive at all. Indeed. 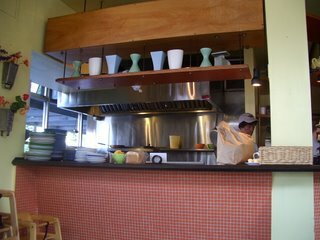 Why in fact, it’s caused quite a bit of experimenting on the part of Hawaii’s newspapers and local homecooks more than once. But after reading the recipe, I think I’ll stick with purchasing them! 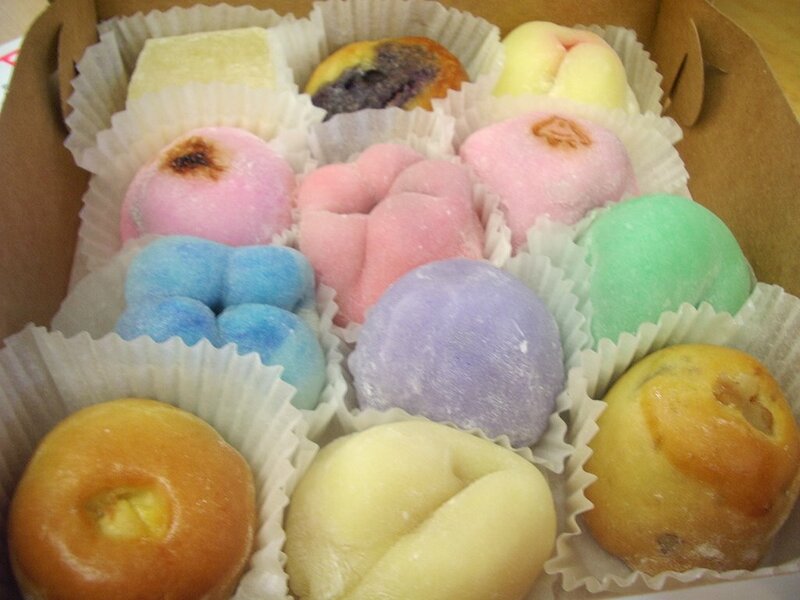 Ginza Kimuraya, Sconees…Pastries for Lunch! A bakery stop at Ginza Kimuraya en route to the post office. Making the stop was the RIGHT move indeed. I passed the bakery right after 11am when a ‘ding ding’ reminder when off in my head. Bakery sensor, I tell you. 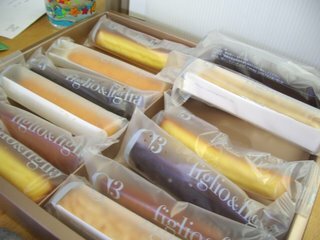 11am is PRIME TIME for hot goods leaving the oven, making its way onto the display cases at Ginza. I made an instinctive U-turn, and viola! found myself waltzing into the bakery. Totally forgetting my resolution to stop eating so many sweet things. Some things were not meant to be. One pastry I craved in particular was the Milk Brot. 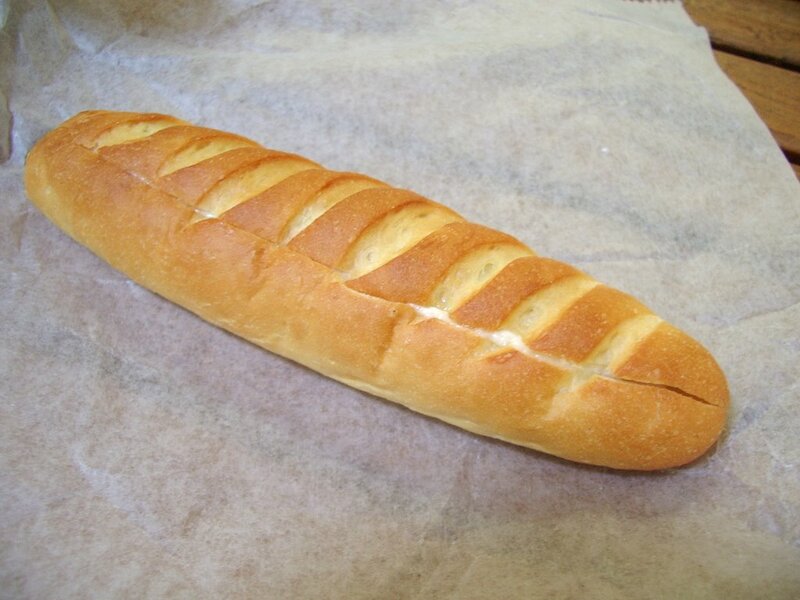 Think of a mini, slight softer and sweeter sister of a baguette. The Japanese interpretation. Then slice the sweet baby baguette right down the middle and pipe in a daring mix of whipped butter, condensed milk and sugar. The warm bread soaks up some of the buttery spread but leaves enough for a bit to ooze out with every bite. Imagine. Hot bread, sweet spread. 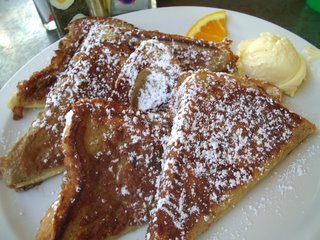 It brings back memories of school day breakfasts of toast with butter and sugar. Only more refined. But just as decadent. Well then I thought, ‘I’m already here. And everything is warm. So FRESH. It needs to be eaten. It must!!! So I did. 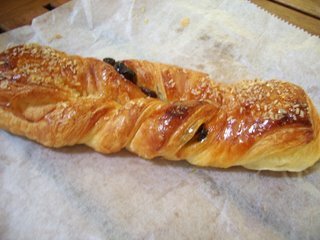 The “special” good for the day was an orange croissant twist. The heavy brush of sugar syrup on top made it overly sweet and I thought the raisins didn’t quite fit in. Scratching my head, I plunged on with bite after bites, peeling apart the soft wispy layers, each one with the faintest hint of butter. Ay yah. This was a really filling lunch. 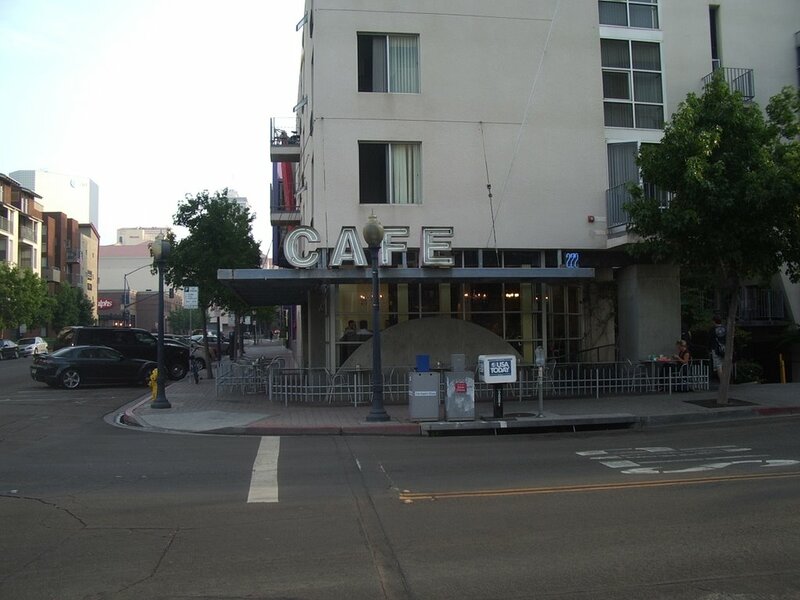 Bakeries were invented to give human heart attacks. And we love them all the same. I went to my mom’s office afterwards to help her out with emails and a few administrative thingamagiggers. I’m going back to school on Monday, which makes me sad and happy and mostly wistful. But these last few days – no more summer school, work or obligations. 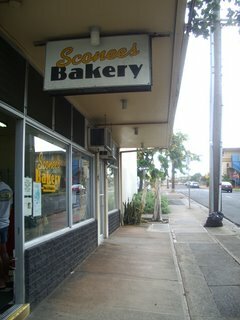 Just family time :) I took a walk along Kaimuki’s Waialae Ave in the later afternoon. Too much staring at the computer in a freezing cold office can drive you crazy. And I walked. And walked. Past the comic book stores, Cafe Laufer, C&C Pasta, Bozu, Kaimuki Choy Suey, Verbanos, poking my face in the windows of everyone, examining menus I already memorized from past walks. I like doing things like that. Then I passed Sconees. Exactly five minutes, mom pulls up on the side. “Oh, you got something – a scone?” She peers eagerly at the bag, attempting to see right through with her nonexistent x-ray vision. Mom loves to eat as much as I do, only she’s better at resisting the sirens of sweet baked goodness. “Oh, I don’t know…my hand. It just wandered there and pointed at the cornbread. And before I knew what happened, my wallet opened and out flew a dollar bill. 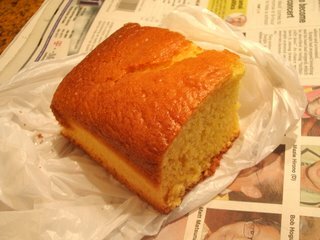 Suddenly the bill disappeared and in place of it was a golden corner cut of cornbread. I, I really have no idea.” OK, I was happy. Really. That’s JUST how it happened. I’ll leave you with happy thoughts that my $.64 corner piece was mighty delicious. 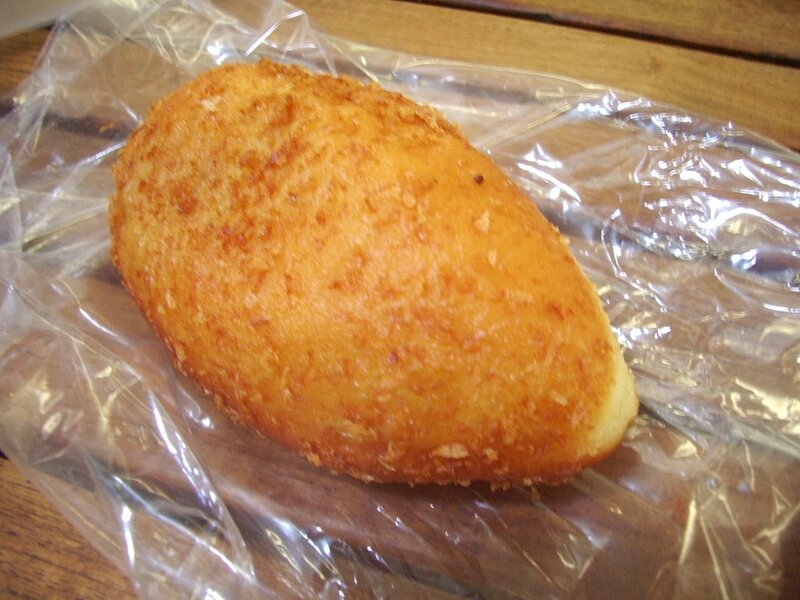 Crusty around the edges, buttery and just so corny soft throughout. Imagine having it warm! With butter, of course. And yes, I shared with my mom. Holy moly. I am so full. Sigh, it seems like that’s how I always start my posts. But it’s the truth! 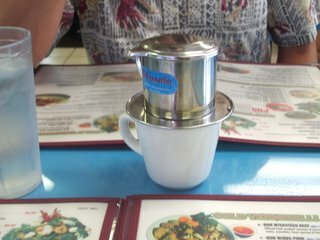 We took at family friend out for lunch at Pho 97 today. Instead of ordering individual dishes, we did it family style. This tends to be more fun as you get to taste everything but the problem is (for me at least) is that I end up eating far more than I ever intended. I cannot stand wasted food. It drives me crazy. Absolutely crazy! I can stop eating if I set aside what I will not eat in the beginning. But that doesn’t happen often. I am like the human shovel bucket. I thank someone or something everyday for a fast metabolism. We ordered a broad range of dishes as our guest has not gone past the realm of Pho and Spring Rolls in terms of Vietnamese foods. First up was the duck and bamboo noodle soup. 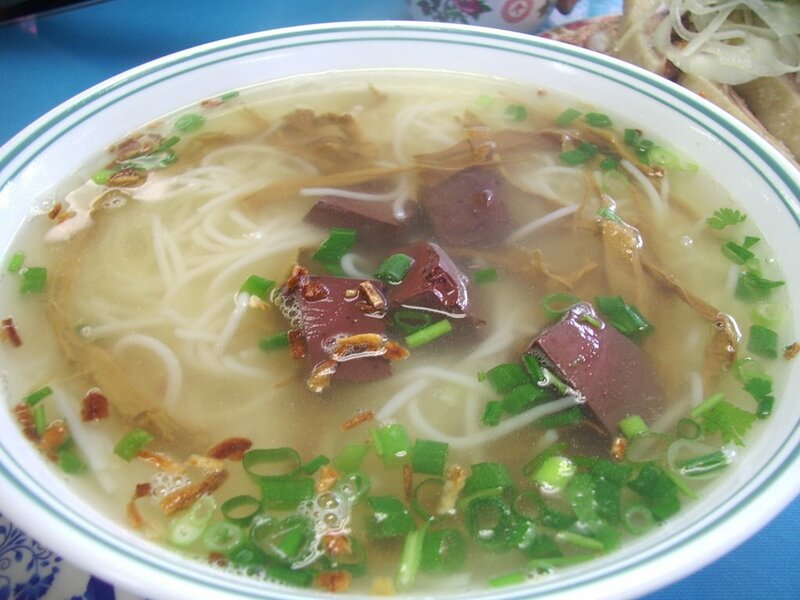 The duck is served separate from the noodle soup, like a salad. 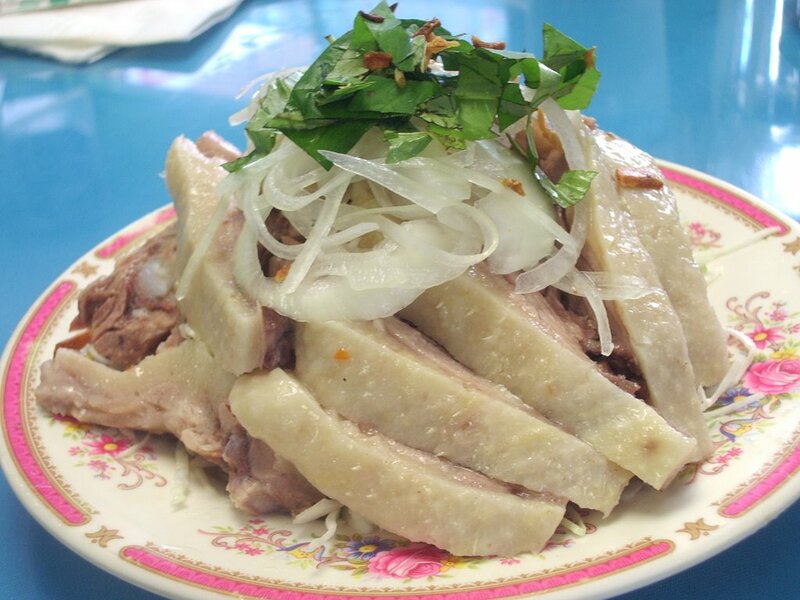 Duck is one of my favorite meats and that’s probably because it is quite fatty and so favorable. Here it is sliced cold and surrounds a mound of shredded cabbage, onions and minced ginger and green onions. We picked off the duck and pour some nuoc nam over the cabbage before mixing it all together. It’s tastes light, crunchy and carefree – like a good summer day! 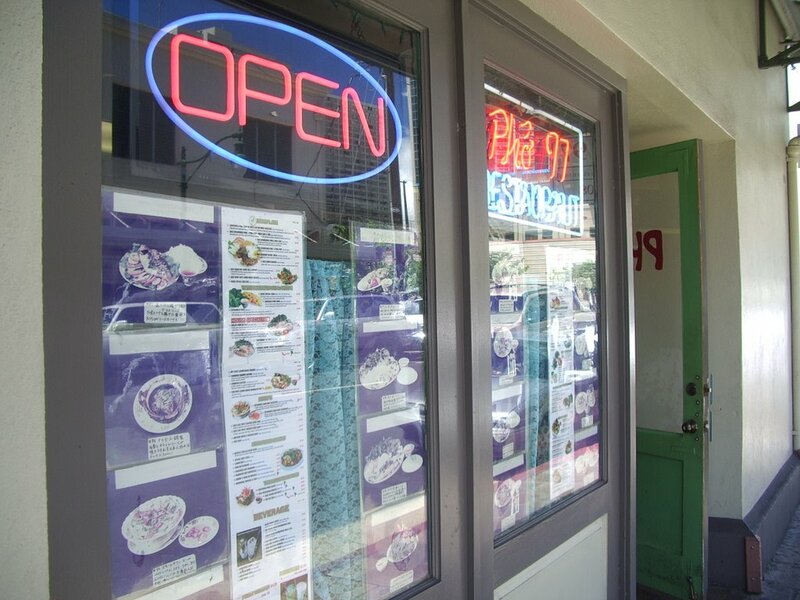 The spring rolls were especially good. I’ve eaten too many of the “local kind” spring rolls recently, which are akin to the kind you receive with your delivery of greasy Chinese takeout in nyc. Heavy, oily skin with a fatty filling. Even worse cold. But the skin here was crisp, light and hot. Wrapped tightly around shrimp, pork and vermicelli, I ate quite a bit from this plate. 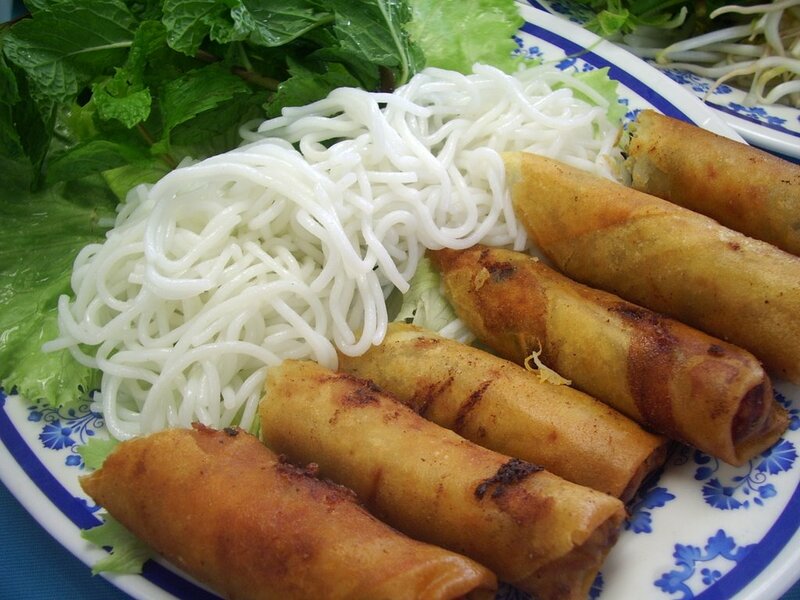 Take a piece of lettuce, a bit of noodles, bean sprouts and basil, put the spring roll in the center and roll it up. Mmmm, indeed! The sugarcane shrimp is eaten in the same manner, only they serve it with dried rice paper which forms the base for wrapping. Replace the thicker spring roll noodles are very thin noodles steamed together, forming layers of thin squares. Shrimp paste is wrapped around the sugarcane then grilled. I suppose the sugarcane is to impart some of its sweetness into the shrimp…but sweet or not, it’s good to eat. The shrimp is chewy, like fish cake or beef balls but so much better because of the smoky char. 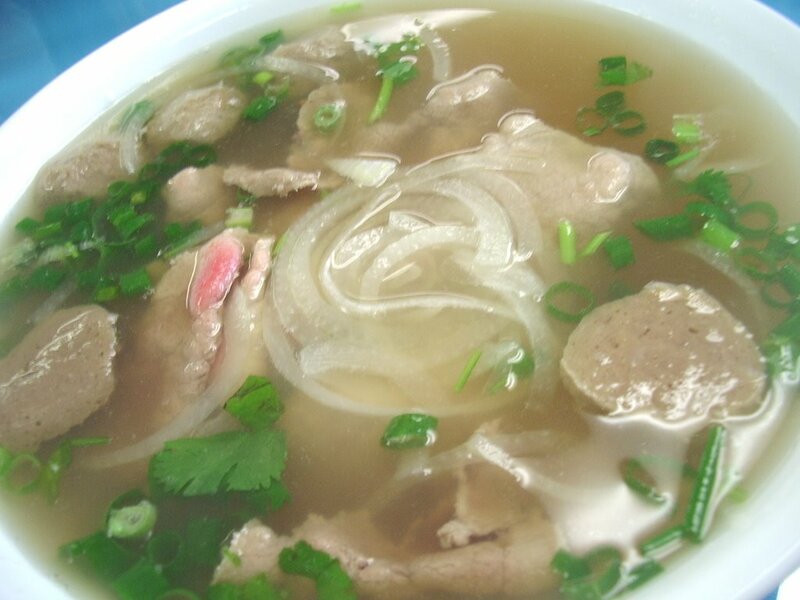 And the ever popular pho. The veggies were clean and fresh, like how they ought to be. 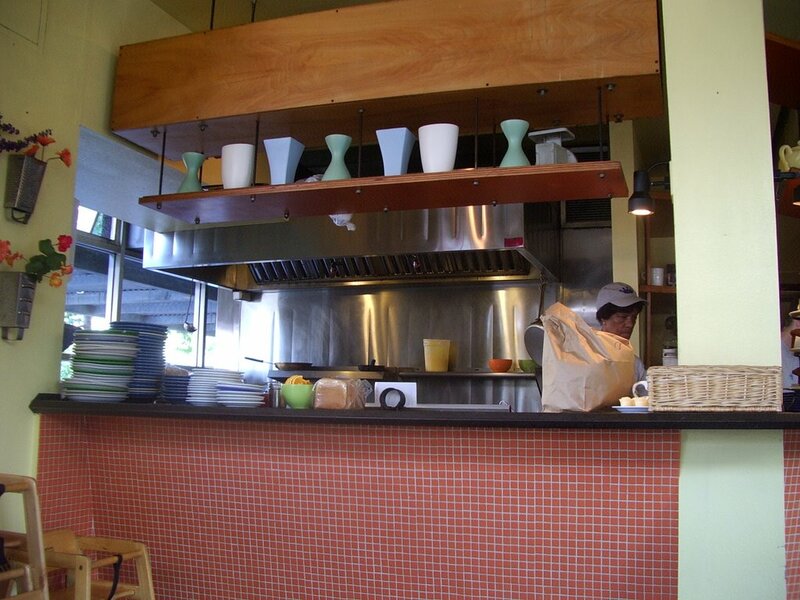 This restaurant has high turnover, so no worries about freshness here. 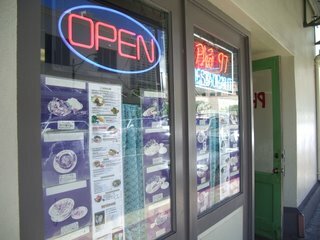 I can think of many place in town that serves better pho, but not one that offers such a wide range of Vietnamese dishes. The broth was a bit salty and they didn’t serve the beef rare, on the side as I would have liked, but other than that it was your standard, hearty bowl of pho. This dish is a good choice for the indecisive! It vaguely reminds me of a local plate lunch, only much healthier. The rice is my very favorite part of the dish, broken up jasmine rice. Like couscous, only with more bite and substance. 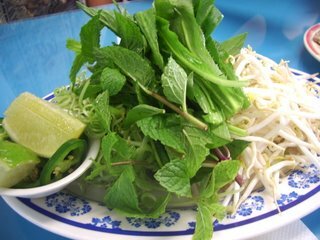 I supposed the increased surface area just makes it more efficient in soaking up nuoc nam. The yellow square is…the best. Ever! 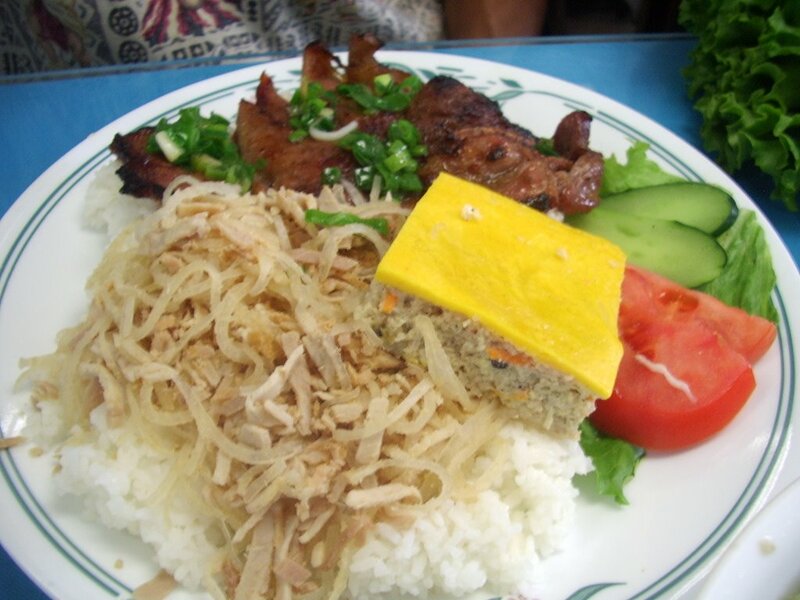 I love meatloaf and I love the Vietnamese take on it even more. Yes, just like meatloaf, only leaner and with vermicelli used in place of bread crumbs. It has a bit of bounce and the light flavors pair well with the rice. At the top are slices of lemongrass barbequed pork chops. I’m loyal to my grandma’s version, so I must say these weren’t nearly as good as hers :). On the left is a mix of shredded pork skin, grilled pork and other wonderful meaty delicacies tossed in roasted rice powder. I apologize if that doesn’t shed much light, but if you come to Hawaii I’ll be sure to take you here! 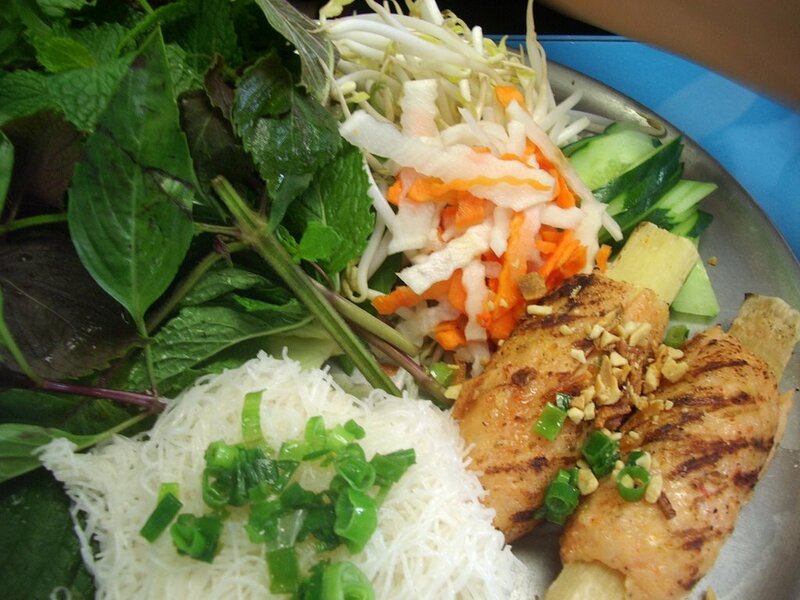 It also is to be mixed with the rice and a spoonful of nuoc nam. Nuoc nam is like the magical Vietnamese condiment. It flavor and makes everything all the more delicious. Sounds quite dangerous, no? 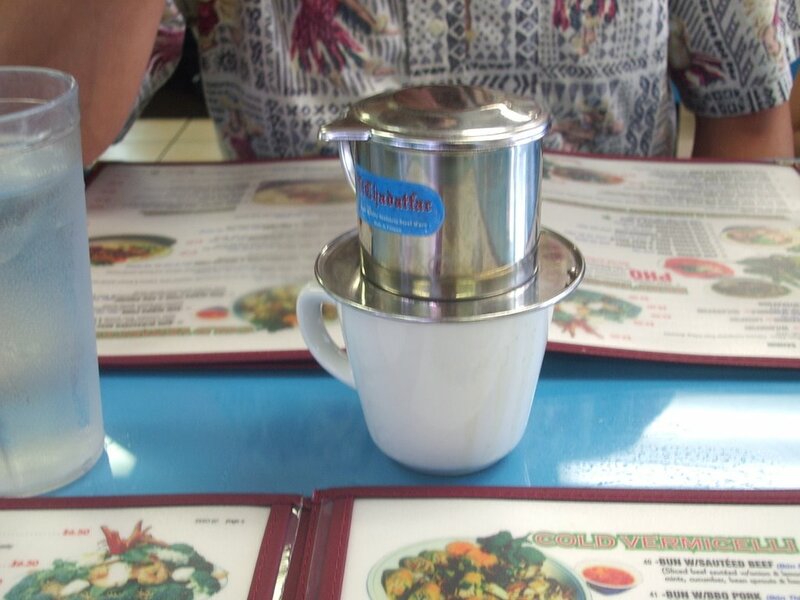 We all ended with a nice cup of cafe phe su, the Vietnamese drip coffee. At the bottom of the cup is a good serving of sweetened condensed milk. Once all the coffee (very strong!) has dripped down, just give the coffee a swirl to mix in the milk. I prefer it much over American coffee as I find the flavor more hearty and robust. Like coffee…maxxed out. lol. I hope that gives a vague idea. I like lots of milk, till it’s not so much coffee but more of a dessert whereas dad likes it without milk. Oh so bitter. Shudder. One day I’ll learn to love bitter coffee. But while I’m young, let’s keep it sweet. What I discovered today: Kelly’s house is full of really good Japanese snacks. I’m afraid our lives are not terribly exciting at the moment. We lounged around her kitchen, complaining about the heat, complain about our lives, trying to figure out why I’ve never had a boyfriend while my sister, my cousin and it seems the whole world has had one or two or three and trying to guess how many cavities I’ve accumulated this summer. Between pondering out loud the whys, whos and why why why of our lives we covered a pretty decent territory of FOOD FOUND ON KELLY’S KITCHEN TABLE. She just returned from Hilo last night bearing boxes of the most wondrous mochi from the Two Ladies Kitchen. And such beautiful and color creatures they were! This box was for Steph but I had the blue one on the left there. You would have wanted one too. :) There was a dozen of assorted mochi and manju, ranging from azuki bean, lilikoi, baked blueberry, peach and sweet potato. They’re just about the happiest looking creations in the world. 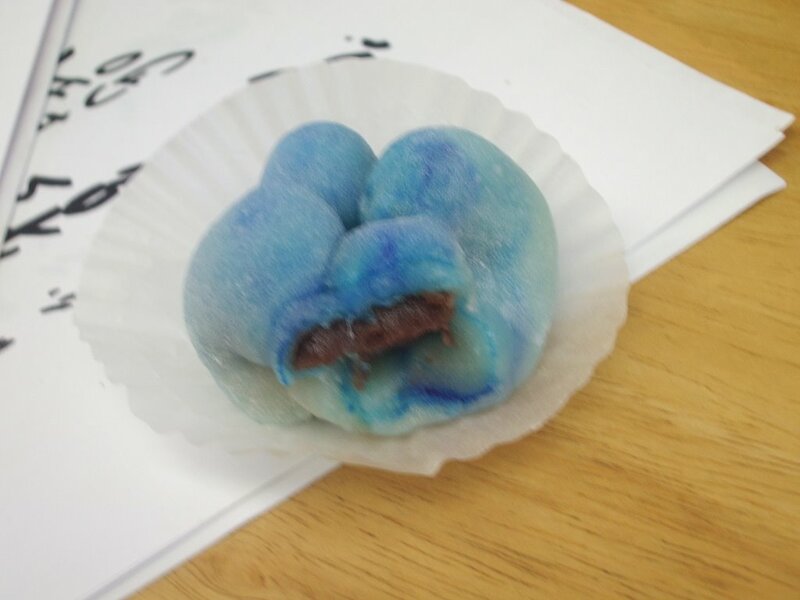 I was expecting a blueberry filling giving the color of the mochi, but was surprised to find not only azuki bean paste but the paste along with…bits of rice krispies rolled in white chocolate! 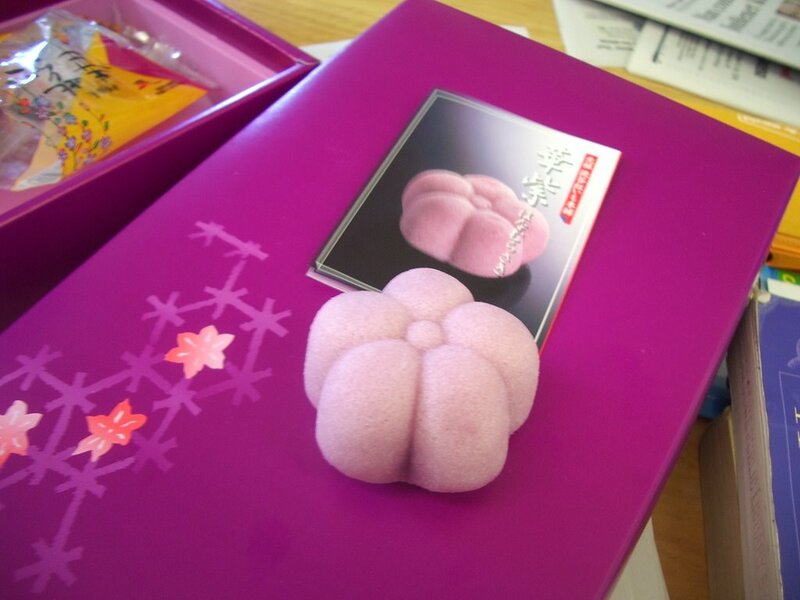 Talk about modern mochi! Oh it was so good, soft, chewy and not too sweet. The white chocolate and occasional bits of ‘crunch’ gave a nice change from the always welcome but occasionally boring azuki bean paste. Who would have ever thought to put the two together? Hah. Magic, I tell you. But the real specialty of Two Ladies Kitchen is their strawberry mochi. They don’t look like much from the outside aside from their enormous size, but I’ve heard enough about the quality and taste to know that they are indeed fantastic. 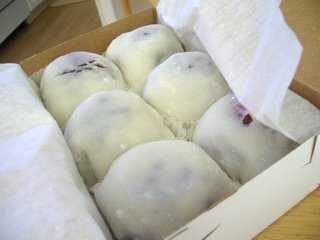 James from Big Island Grinds has a nice split shot of the mochi. I think his strawberry was surrounded by a white an, though the one Kelly brought back was the red tsubushian. Either way, you can’t go wrong! Oh glory be! Now what is this? 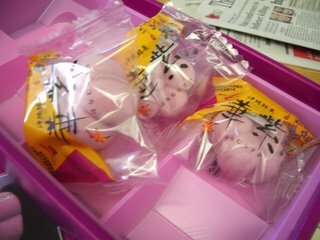 We initially assumed it was mochi given what we had just eaten and the presentation and design of the treats. Not hungry, but very curious, we opened a pack and slid out the purple flow. Oh! 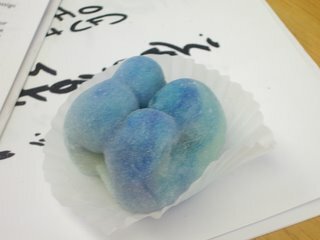 It did not feel like mochi at all, but a soft, moist sponge cake. 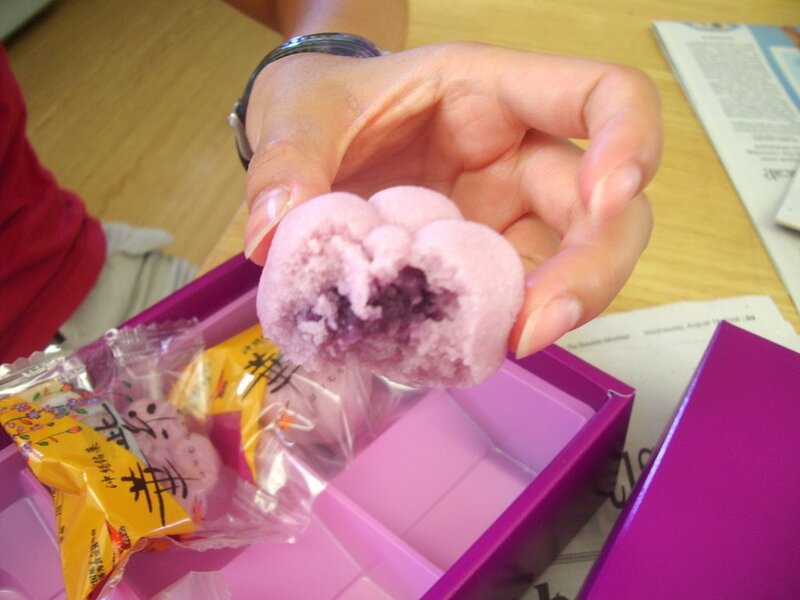 The first bit revealed a soft, mildly flavored cake/mochi. The second bit led to a smooth filling of sweetened whipped plum paste. So odd. So good. I couldn’t quite place the flavor at first, sweet, but with a little tang. It was familiar but I haven’t had plum in a sweet confection for such a long time that I’ve nearly forgotten how wonderful it can taste. “no, YOU!” and I took from here, and indeed I am crazy. It was hot! We did a little inspection and pulled off a tiny little patch from the inside skin of the wrapper. It said, “Oxygen Heater” or something like that. What it did for the confection, I do not know, but the Japanese really do think of everything don’t they? Underneath the purple box was a more sophisticated, subdued gray box. Ooooh, curiousity strikes again! We lifted the lid of Figlio & Figlia to find an assortment of cake sticks! Cake sticks! How much fun is this? You can have just one or a bit of alllll the cakes. Or a bite of his and two of hers. It’s just the best world ever. Since I just had burgers and fries from W&M less than an hour ago and plenty of sweets too boot, I split the shortbread jam with Kelly. We had a rather difficult time picking between the chocolate sponge, butter cake, and almond puff pastry but I think we made the right choice. The shortbread was light and perhaps more flaky than buttery. 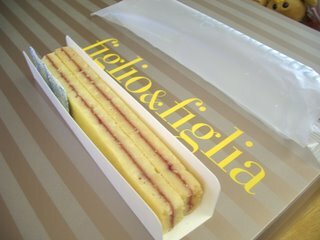 The layer of jam was so subtle that you don’t really notice it’s presence until you taste just a hit of something sweet and fruity as the cookie dissolves. So that’s how I spent my Thursday, eating burgers and fries on the beach then clearing off Kelly’s kitchen counter by filling my stomach. An hour later we drove down to Jamba Juice. The Matcha smoothie for me and the Red Gummy Bear for Kelly. Red Gummy Bear? you ask. Yes Yes! 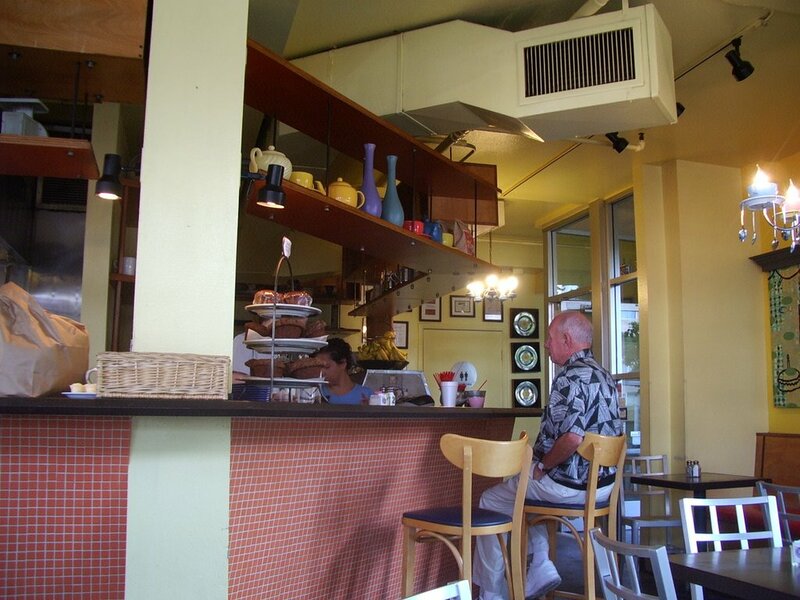 It’s a Hawaii only creation, so you mainlanders should fly over here for a taste. I swear, it’s tastes exactly like The Red Gummy Bear. We even have White Gummy Bear and Strawberry Starburst!